dents should be looking out for. I also wanted to add comprehension questions at the end to launch into our in-class discussion the following day. Long story short I needed to be able to convert the text into text. Every once in a while I had to do this before, but I had never come up with a good method. Apple claims that with the new version of Snow Leopard that you can do it in Preview. I have tried this a few times and it just doesn’t work the way it is supposed to every time. Plus it only works on some PDFs and not on every one. rom PDF to text for you quickly and easily. 1.) Go to your Gmail account and click on the Docs tab at the top. 3.) This brings you to an Upload files page. Click the blue text that says "Upload files." 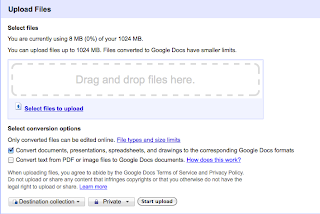 Follow the steps to upload your file. This is very similar to attaching a file to an e-mail. 4.) After you attach it you will notice that the page will refresh and it will have your document listed in the box. Upload more documents if you want. 5.) 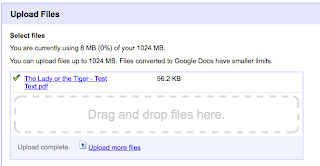 Google uses Optical Character Recognition (OCR) to complete the transfer. There are however limits and restrictions. For a full outline of those and how OCR works click here. 6.) At the bottom of the page be sure to check the box titled: "Convert text from PDF to Google Documents" so that conversion can happen. As you will notice there will be the scanned pages above each block of text that came from the PDF. The OCR is not perfect and it will not transfer certain tables and diagrams, but with the text it does a great job. 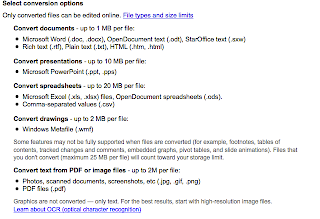 Now that the text is in a Google Document you can edit, manipulate, or even export to a Word Document. Google Docs saved the day for me and allowed my class to be very productive all within only one file. Most important this technology is free with a Google account. Happy converting!